You’re flying across the snow. Your whole body is working in sync to propel you forward; your arms are pulling, your legs are kicking, your heart’s pounding, and your breath is deep and steady. For a whole-body winter workout, nothing beats Nordic skiing. This low-impact exercise delivers amazing cardiovascular benefits, works all the major muscle groups, challenges your balance, keeps your joints healthy and is good for your mental health. “And it’s fun,” says Peter Marshall, the Nordic ski school supervisor at the Eldora Nordic Center. Calorie burn goes hand-in-hand with the sport’s cardiovascular benefits. Because so many muscles are working simultaneously, you naturally burn a lot of calories. 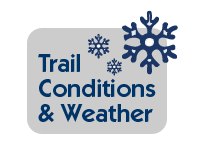 Recreational skiers may burn as many as 600 per hour; racers can burn over 1,000. As your muscle mass increases, you’ll burn calories long after you take your skis off. Nordic skiing promotes healthy joints, too. Because it’s low impact and requires only a small range of motion, you can ski for hours without stressing muscles, joints, or ligaments. This makes it a good option for those who can’t tolerate high impact activities. We’re lucky to live in an area where we can mix up our exercise routines to accommodate the changing seasons. 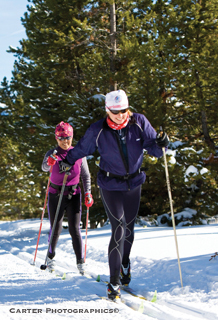 Keep your winter workouts interesting this year with Nordic skiing, and reap the sport’s many mind and body benefits!